Paul F. Knitter is the Paul Tillich Professor of Theology, World Religions and Culture at Union Theological Seminary, New York City. He was formerly Emeritus Professor of Theology at Xavier University in Cincinnati. Since publishing his book, No Other Name? (1985), Knitter has been widely known for his religious pluralism. 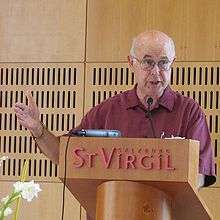 Along with his friend and colleague, the Protestant philosopher of religion John Hick, Knitter came under criticism from the then-Cardinal Ratzinger, later Pope Benedict XVI. In 1984 he was one of 97 theologians and religious persons who signed A Catholic Statement on Pluralism and Abortion, calling for pluralism and discussion within the Catholic Church regarding the Church's position on abortion. Knitter holds a licentiate from the Pontifical Gregorian University in Rome (1966), as well as a doctorate from the University of Marburg, Germany (1972). Towards a Protestant Theology of Religions, 1974. No Other Name? A Critical Survey of Christian Attitudes toward World Religions, 1985. The Myth of Christian Uniqueness: Toward a Pluralistic Theology of Religions. Co-edited with John Hick, 1987. Faith, Religion, and Theology: A Contemporary Introduction, 1989. Co-authored with Brennan Hill and William Madges. Buddhist Emptiness and Christian Trinity Essays and Explorations, 1990. Co-edited with Roger Corless. Death or Dialogue: From the Age of Monologue to the Age of Dialogue, 1990. Co-authored with John B. Cobb, Jr., Monika Hellwig, and Leonard Swidler. Pluralism and Oppression: Theology in World Perspective, 1990. Edited. One Earth Many Religions: Multifaith Dialogue and Global Responsibility, 1995. Jesus and the Other Names: Christian Mission and Global Responsibility, 1996. The Uniqueness of Jesus: A Dialogue with Paul Knitter, 1997. Edited by Leonard Swidler and Paul Mojzes. Faith, Religion and Theology: A Contemporary Introduction, 1997. Co-authored by Brennan Hill and Williams Madges. Introducing Theologies of Religions, 2002. Subverting Greed: Religious Perspectives on the Global Economy, 2002. Edited with Chandra Muzaffar. Without Buddha I Could Not Be a Christian, 2009. ↑ "PAUL F. KNITTER". Union Theological Seminary. Retrieved 20 January 2010. ↑ "Paul F. Knitter Biographical Summary". Friends Theological College. Retrieved 20 January 2010. ↑ Keller, Rosemary Skinner; Ruether, Rosemary Radford; Cantlon, Marie (2006). Encyclopedia of women and religion in North America. 3. Indiana University Press. pp. 1104–1106. ISBN 0-253-34688-6.